sad and surprising (but not surprisingly sad) news hit the basketball community when the foundation of the jazz team and the only remaining link to the nba finals run decided on early retirement. i was as devastated as the next (casual) basketball super-fan, but i knew that he was following his heart. his ten-year tenure (i can’t believe i typed that — i think i only did it to piss brian off) with the utah jazz had its “ups and downs — hopefully more ups than downs,” but was the major reason that the jazz experienced such post-season success throughout that decade. he was a warrior on the court and a teddy bear in the locker room. he brought toughness and togetherness to a team that didn’t seem to have an identity or a direction. he was a great basketball player and i’m sure he would have been a dear friend, had i ever met him outside of my dreams. 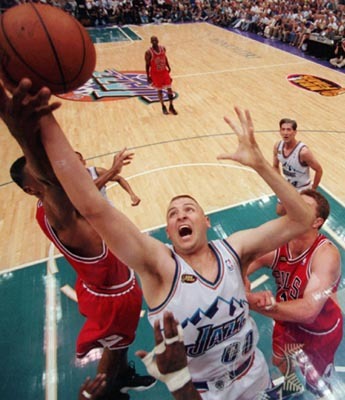 greg ostertag was drafted 28th overall in 1994 after being the top shot-blocker in big eight conference history. he started 10 games as a rookie and averaged 1 block per game in around 11 minutes. the next season, the jazz expanded his role on the team and enjoyed their first trip to the nba finals thanks to their decision. utah had been unable to get past the conference finals in 4 out of 5 years. ostertag was the guy that put them over the top. they advanced to the finals two years in a row and if it wasn’t for jordan’s push-off, greg ostertag would have led his team to an nba championship. his nba career averages include 1.7 blocked shots per game in under 20 minutes with a career field goal percentage of 48.6%. he finished 1-10 from 3 point range in his career. greg ostertag was always known for his ability to turn on the heat when it was playoffs time. i’ll always remember how much fight he had in him when the game was on the line. in 2002 he donated one of his kidneys to his sister. he also has a tattoo of fred flintstone dunking a basketball on his leg. he will be missed when the 2006-2007 season comes around and i doubt the jazz will make the playoffs. they never had a losing season the whole time greg played in utah and they never missed the playoffs until this year. i’m positive that if they would have let him play more minutes this year they would be battling it out with the mavericks for another shot at the conference championship. even after stockton and malone left, the jazz still had a good season and made the playoffs. but when ostertag left the team last year, utah suffered its worst season in 20 years. i shouldn’t have to convince anyone about his importance to the jazz franchise. his influence speaks for itself. i look forward to getting free tickets to jazz games and sitting like 6 miles from the floor. if i have my way, i’ll sit right under the jersey that reads 00 and i’ll remember his legacy. i look forward to eating sandwiches in the grass near the statue that he deserves. he might be retiring from basketball, but he won’t ever be able to retire from my heart. greg ostertag announced his retirement from the national basketball association on april 17th, 2006. he was preceded in retirement by antoine carr, william cunningham, jim farmer, greg foster, jeff hornacek, adam keefe, karl malone, chris morris, ruben nembhard, and john stockton. he is survived by shandon anderson, howard eisley, troy hudson, and bryon russell. May a flight of angles sing thee to thy rest in the Delta Center rafters. brian called me this morning and reminded me that ostertag’s made 3-pointer was supposed to be an alley-oop to kirilenko. How can you talk about Ostertag and not mention Mike Brown?